The world’s population is estimated to be 7.5b and the installed base of mobile phone (smartphones and feature phones) is approximately 4.0b. The continent with the least penetration is Africa, which has a penetration rate of ~70%. One of the long term forecasts for the mobile phone market is that feature phones will be reach a price point of US$25 that would enable another 1.5 billion people to be added to the Internet. The most susceptible area of the world is Africa, which has 1.2 billion people. 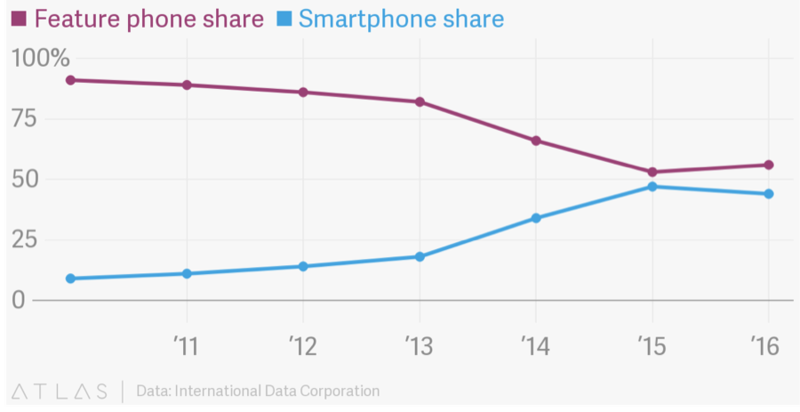 As shown in the next chart, sales of mobile phones have grown to 220m with the split of feature phones/smartphones at 55%/45%, respectively. 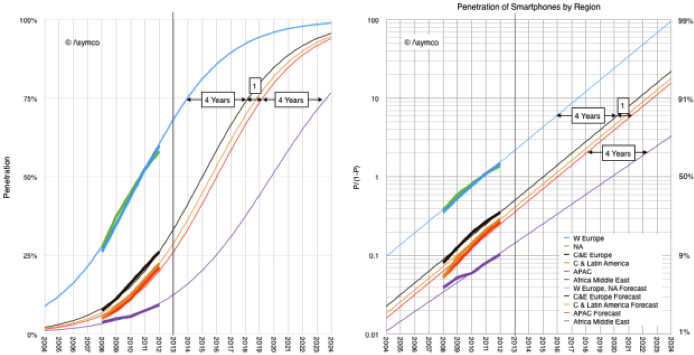 ASYMCO shows that Africa is ~4 years behind the APAC forecast, which would put Africa at a 90% penetration level by ~2020, adding 300m phones, if the annual sales rate continues. 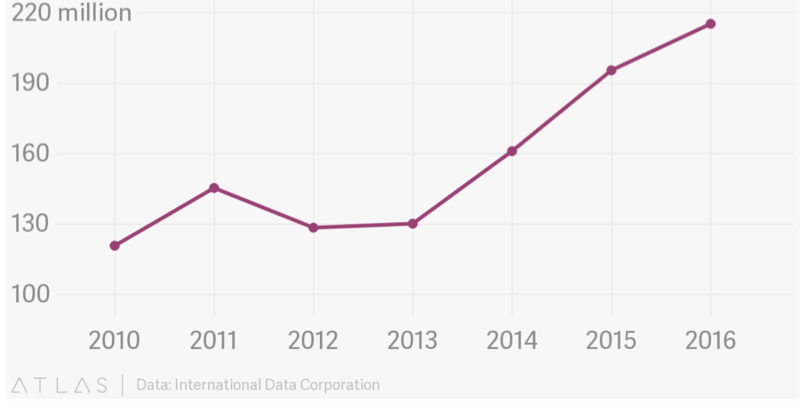 Essentially, this is an addition of ~50m new mobile customers per year. 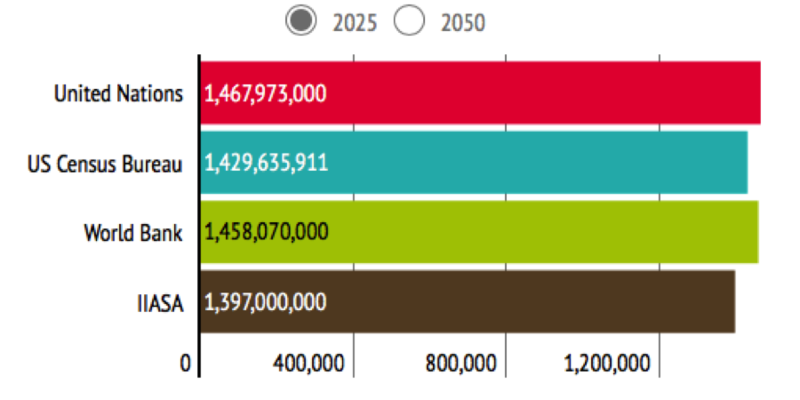 African population projections for 2025 range from 1.397-billion to 1.486-billion, which puts the number of mobile phones in 2025 between 1.3b and 1.4b up between 400m and 500m over the 8-year period. The increase in Africa is unlikely to have much effect on smartphone sales as the continent will not have much of a middle class to pay US$300 or more for a phone.